Konkrete 3's barely contained weirdness sets it apart from other drum libraries, as does its unusually tweakable interface. The original slab of Konkrete earned a five star review in SOS in September 2006. Back then, it snarled like an attitude-laden adolescent, its distinctive samples formed into 24 scratchy, glitchy, twitchy drum kits. Control was minimal but this didn't stop it, and later Konkrete 2, which ran broadly along the same lines, from being equally ear-catching. 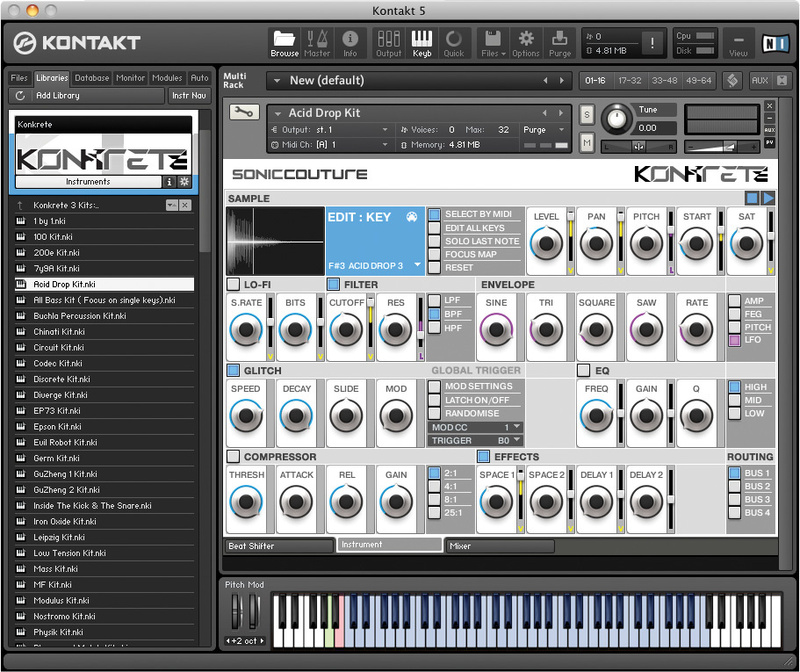 For Konkrete 3, Soniccouture have upped the ante with a totally revamped interface and enhanced functionality. Better still, the kits of all three Konkretes are bundled together in this release, and upgrade deals are offered to owners of the previous libraries. I'm hoping that excessive use of the letter K won't attract the pointy-hat brigade, because this review is going to be knee-deep in them! 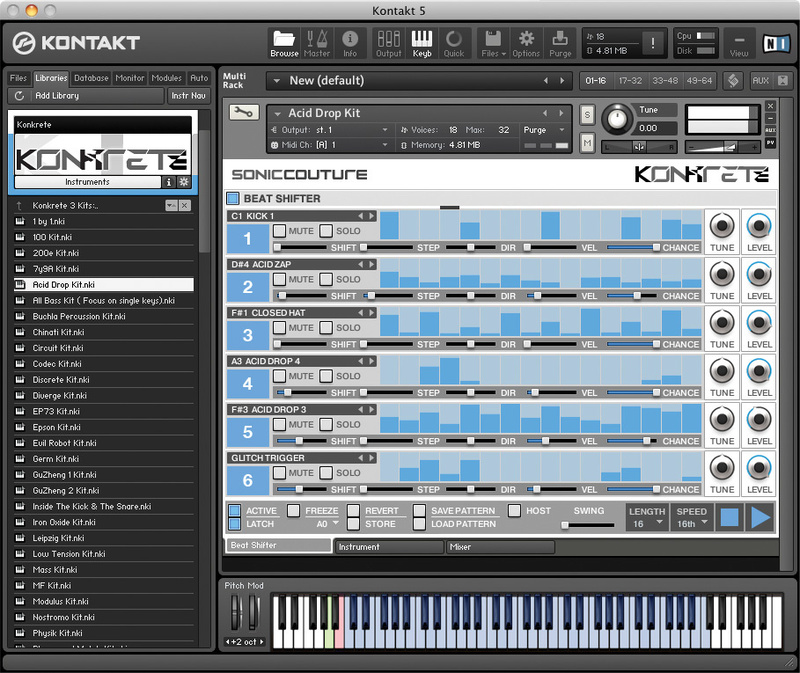 Konkrete 3 is a Kontakt instrument and runs under either Kontakt player or the full version, currently 5.1 or upwards. Installation is a familiar tale of serial-number authorisation, after which Konkrete appears precisely where you want it: beneath Kontakt's library tab. The instrument is neatly divided into three folders (Konkrete 1 to 3) and each is packed with kits of at least 61 notes. Users of Native Instruments' Maschine can also install the kits as Maschine instruments, the only proviso being that, since Maschine's kits are limited to just 16 pads, they're treated like regular instruments rather than drums. Until NI extend their kit specification, this remains the most feasible implementation; it simply requires the user to set Maschine to play chromatically. It's usually worth it: drum pads offer a far more natural feel for creating grooves than a keyboard. Konkrete 3's 41 brand-new kits bring the total to 90. You'll be glad to hear that the latest material is as uncompromisingly weird and hard-edged as its predecessors. To appreciate it fully requires a fair investment of time, but it's time you won't begrudge. Gathered from sources as diverse as Buchla and Analogue Solutions synths, knackered Russian drum machines (is there any other kind? ), a nine-foot grand piano and circuit-bent samplers, this lot could easily pose as percussion from an alternate universe. There are more than 5000 samples (the download is around 800MB) and whether they're of wire brushes or washing machines, all are beautifully captured in 24-bit at 44.1kHz. Rather than trying to describe every hit and kit, I'll get the ball rolling with an impression of some of my personal favourites. Xtended Piano: This kit includes seriously meaty low kicks and thuds, plus piano string scrapes, body smacks and resonant boings. Actually, it's a masterclass in creative sampling, and while the results are undeniably quirky, they're ideal for suspenseful soundscapes or other cinematic work. Buchla Percussion: I doubt I'll ever be able to afford a Buchla synth, but for the time being I can be content with this impressive bag of atonal clangs, metallic thwacks and hang-drum tonalities. A packed toolkit for the more experimentally-minded. Thunder Drum: Powerful and occasionally disturbing, this kit is five octaves of the darkest, strangest atmospherics of the whole collection (which is saying something). All I can say is I wish I'd had this lot when working on the music for Channel 5's Serial Killers Behind Bars. Each kit has a very specific identity, and Soniccouture have done a remarkable job, whether sampling Epson printers, vacuum-cleaner tubes or sledge hammers. I enjoyed the friendly twangs of a Chinese zither and sounds from a metal playground, but the harder-edged samples were most representative. Aliased hi-hats and snares like car crashes run riot, while two damaged and thoroughly nasty Soviet drum boxes cry 'radioactivity' scarier than Kraftwerk ever did. Then there's 'Evil Robot', so harsh and uncompromising that I found it a relief to switch to something cleaner and verify that there was no lasting monitor damage! To sum up: some kits are almost normal. Most aren't! A six-row step sequencer with a difference — beats can shift around to create constantly-changing patterns. Having auditioned the factory kits, the next logical step was to see how each could be edited. 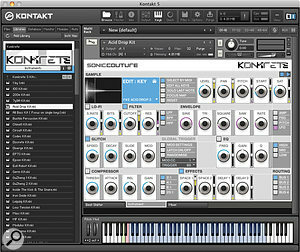 Konkrete 3's panel is split into three tabs: Beat Shifter, Instrument and Mixer. Every parameter is clearly laid out, meaning that minor (or major) adjustments quickly become second nature. Enabling 'select by MIDI' brings up the parameters for each drum you hit, ready for adjustment. The synthesis is well conceived for percussive programming. Via a series of sliders adjacent to each control, most of the key parameters can be harnessed to velocity. Some can be controlled by an LFO instead, and there's a separate LFO for every drum! If you find that this is all a bit involved, sweeping changes can be imposed on the entire kit by enabling the 'Edit All Keys' option. To spread one sample over the length of the keyboard, switch on 'Focus Map'. This is the means by which those resonant synth samples are best played, but it's just as applicable to any of the others. Most of the samples are initially strange, cutting, barking, whatever, but they can be suitably transformed with the minimum of mouse clicks. Each has a filter offering low-, band- and high-pass modes, plus a lo-fi processor primed for sample- and bit-rate reduction. Every drum has a compressor, a three-band parametric EQ and three envelopes (pitch, filter and level), so there's no need to ever feel constrained by a sample that doesn't appeal. The LFO's four waveforms can all be freely mixed to create composites but, as they are always free-running, there's no option to sync them to MIDI clock. However, for adding creative chaos and unpredictability, the LFOs work well. 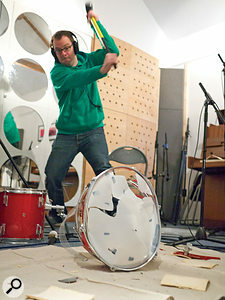 Alongside the conventional tools for fracking with a drum's pitch, tone and volume, there's a global glitch processor. Glitch is available to any drum voice, its parameters generating note repeats and determining whether the repeats get quieter or change pitch. Finally, the mod wheel offers performance control over the amount of glitching, and a randomisation option to helpfully juggle the parameters. The end result is a process that is of far more value than the usual attempt to imitate stuck CDs. Glitch can be activated either by the note B1 or from the sequencer (more on the latter shortly). Konkrete 3's effects implementation is no slouch either, and consists of four bus effects with added dynamics. Courtesy of a series of velocity sliders, the send effects can be controlled by how hard you play. The effects include two excellent convolution reverbs, loaded with custom responses, but be aware that some of the longer spaces are particularly CPU-hungry. Each bus has four insert effects, such as tape saturation, bus compression, transient master and EQ, and these, too, can be greedy. At least the always-useful clock-syncable delays are fairly undemanding. 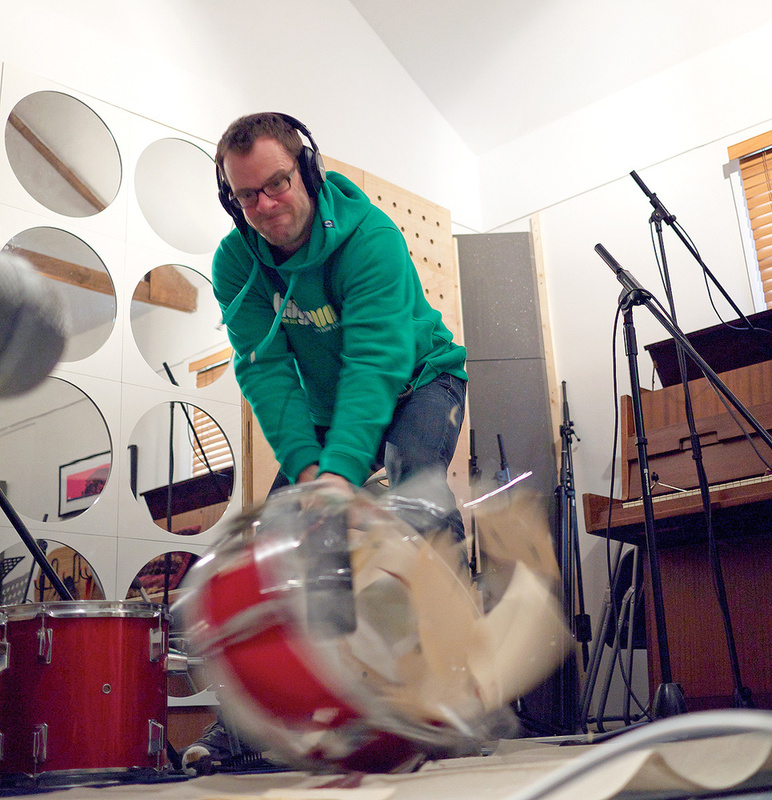 No drums were harmed in the making of this sample library. Konkrete 3 is already a worthy drum brain, but there's a simple six-row step sequencer present too, with variable length, swing and rate. The sequencer's bottom row can also trigger the glitch process, which is often lots more fun than triggering it via a key. This isn't just an ordinary sequencer: the shift, step size and direction sliders for every row hint as much. Notes are drawn in with the mouse and high values correspond to high velocity. Then, if you move any Shift slider beyond zero, it increases the chances that the pattern will shift during playback, the shift amount being set by the Step Size parameter. Thus, with a Step Size of four, whenever a shift occurs it will be four steps. Uneven shifts produce the wackiest patterns! The direction slider can limit the movement towards either the right or left, or any point in between, while the velocity slider introduces random variations in the velocities generated. After playing around with Beat Shifter's evolving patterns, I made the innocent suggestion, 'wouldn't it be nice to include the probability of notes not playing at all?' Remarkably, a few days later Soniccouture were back in touch informing me of an update: they'd introduced a Chance slider for each row. At Chance's maximum setting notes always play, as before, but when you move the slider towards the left, the chances increase that notes will be left out. How could I be anything other than impressed? Pushing the controlled madness still further, the sequencer's triggering of the global Glitch processor is subject to the same shifting and chance operations as the other rows. It all adds up to a more-than-standard drum machine and its output can occasionally be mind-blowing. More than once, I was thankful for the individual mute and solo buttons to isolate exactly what was going on! Six rows might not sound like a lot on paper, but in reality it's plenty. There's a stash of complex patterns waiting to be uncovered, one programmed into every kit. It's also an easy matter to load patterns from different kits and start to build a library of original grooves. Oh wait, yes they were. Real concrete isn't well-known for being warm and cuddly, and you definitely know when it lands on you. Konkrete 3 is equally difficult to ignore, its cold, hard and often unplaceable samples forming a surprisingly coherent collection. Turning the results into authentic-feeling instruments is an art form in itself and it's worth stating that the earlier Konkrete kits haven't merely been bolted on; they've been reworked for the new interface and programmed with unique shifting beats. By its very nature, Konkrete won't appeal to everyone, but it's more versatile than it first appears. The temptation is to assume that the kits are only suitable for industrial, IDM, glitch or dark, unsmiling electronica, but Konkrete 3 could freshen up almost any genre, except possibly New Age. My only concern was the amount of CPU load sometimes reported when running under Logic. Typically this was traced to one of Konkrete 3's convolution reverbs and backing off the reverb size was a workable answer. Thanks to its fast editing, beat shifting and glitches, Konkrete 3 is an inspiring drum machine and a source of wildly unusual loops. It could be the ideal place to head whenever you're in need of edgy, creative stimulation. Windows XP (SP2, 32-bit), Vista (32-/64-Bit) or Windows 7 (32-/64-Bit), Mac OS 10.6 or higher, Intel Core Duo. Mac Pro running OS 10.6.8, 2 x 2.66GHz Quad-Core Intel Xeon running in 64-bit mode, 12GB RAM. Logic 9.1.8 in 64-bit mode. A series of unusual samples beautifully arranged into kits. A skilful balance of user-interface clarity and tweakability. Beat Shifter and the Glitch Processor combine to generate intricate and evolving patterns. The convolution reverbs are CPU-hungry. Some of the samples might frighten your mum. 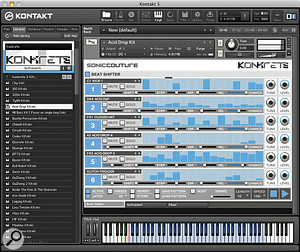 Konkrete 3 is a maverick drum machine in Kontakt format, its aggressive, alternative sample library offering kits you won't hear anywhere else. Unlikely to be required for meditation or yoga CDs.